Imagine a special team of super elite commandos that have been specifically trained and equipped to eradicate terrorist, fight fires, and rescue people that are trapped in the upper floors of burning building during a worst case scenario – like another 9/11. If such a team had been in place a decade ago, stationed on the top floor of each World Trade Center, there is reason to believe we could have experienced a dramatically different outcome. Football games are often won by special teams. A good example is the last Super Bowl. Remember the onside kick in the second half? It placed the Saints in the perfect position to score and ultimately win the football game. The same holds true with nearly every aspect of our National and Homeland Security. Every agency plays a specific role that is vitally important to our security needs. SWAT teams are called when there is a hostage situation. Special Ops are called when the military wants to engage with the enemy with surgical precision. Hazmat is called in when Chemical Weapons are involved. Even our fire departments have special units, but nothing, and this being said with all due respect, are at the level being discussed here. Skyscraper Defense Teams will represent our last line of defense should all other measures fail and the enemy has successfully launched another attack or series of attacks. Nobody can argue that. What applied a hundred years ago, when the majority of the fires could be extinguished from a hook and ladder, most certainly doesn’t apply in this era of time. Today, these same vehicles, although they are much more modern, look like toy trucks at the base of these towering skyscrapers. What is needed is a completely different strategy. This is not to say that our existing fire departments and equipment don’t play role, because they do, but not when it comes to fighting fires and rescuing people in the upper floors of a building that is a thousand feet above the streets below. The ‘Act’ will create a new agency within Homeland Security called Skyscraper Defense. The responsibility of this agency will be the security and safety of all our skyscrapers in the event of another terrorist attack or natural act. Cities such as New York, Chicago, Atlanta, Miami, Philadelphia, Dallas, Houston, Denver, Las Vegas, Los Angeles, San Francisco, Seattle, and Honolulu, will be provided Skyscraper Defense Teams. The size of the teams will be determined by the number of skyscrapers in each individual city. 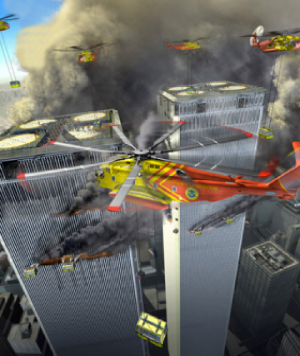 New York City for example, could have 250 or more members stationed throughout the city, armed with a squadron of heavy-lift helicopters that have been retrofitted with foam shooting cannons, firefighting pods, and rescue gondolas that can lowered onto the roof or side of a building or buildings in the matter of minutes. With tens of thousands of soldiers returning from the wars in Iraq and Afghanistan, and thousands of firefighters, police officers, and SWAT teams members that would like a crack at becoming a prestigious Skyscraper Defender, this could be the job opportunity you’ve been looking for. Please join our mailing list, so that we can contact you when the tryouts begin in city near you. Don’t forget to include a resume that details your training and experience background. And good luck!